The border between Sweden and Norway. 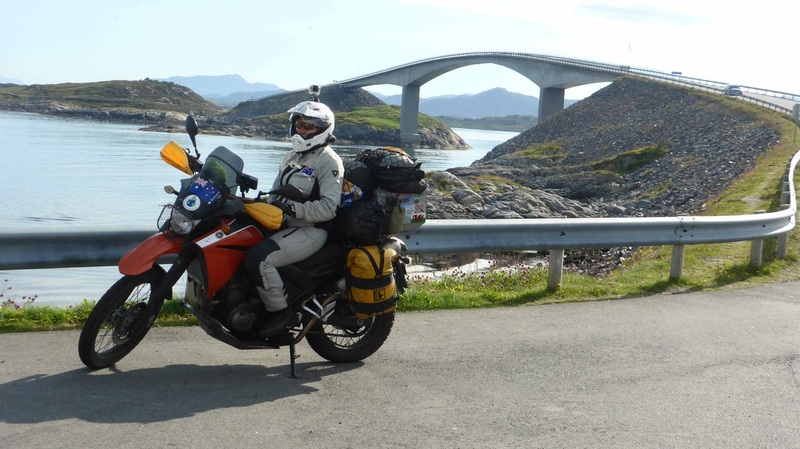 The weather was a bit brighter in the morning, and we crossed into Norway near Mo i Rama, then headed up to the Arctic Circle. 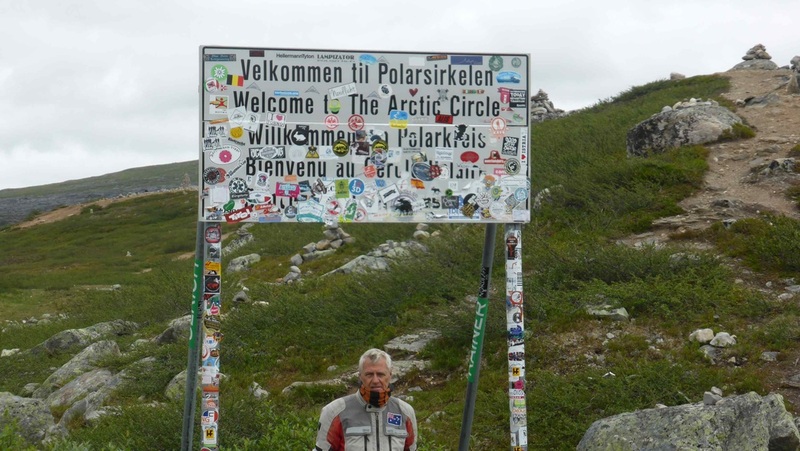 It was freezing riding along, I was glad we were heading south again after we reached the circle. Got to expect that riding up here though, ay! From there we headed south again, through Mo i Rama, and down to Mosjoen, where we got a campsite and put the tent up. I don't think I have camped so close to the snow before. Norway is expensive for everything, don't even try to get a beer under $10, it won't happen, most pubs are around $15! $9.70 for a cold chicken roll for lunch, and petrol is around $2.45 per litre. We had been paying around $30 a night for a hotel room with an ensuite in eastern europe, here the really nasty ones start at around $75 per night with a shared bathroom, so camping it is! The upside is the scenery, lakes and fiords everywhere, snow capped mountains, and heaps of pine trees. The roads are good, and people drive properly, but no one speeds here, the cops are nearly as bad as Queensland! The speed limit on the open road is 80 kmh. Sammy with some boathouses in the background, the scenery here is stunning! After a cold night, (we slept in our thermals), we woke up to find everything soaked in a heavy dew, not quite crispy, but not far off it. Continuing south, the ride was quiet, through heaps more pine trees, through lots af lakes and rivers. Lunch beside a dam, but no water going over the spillway. There were hardly any clouds around today, much warmer riding, we managed to peel a couple of layers off. 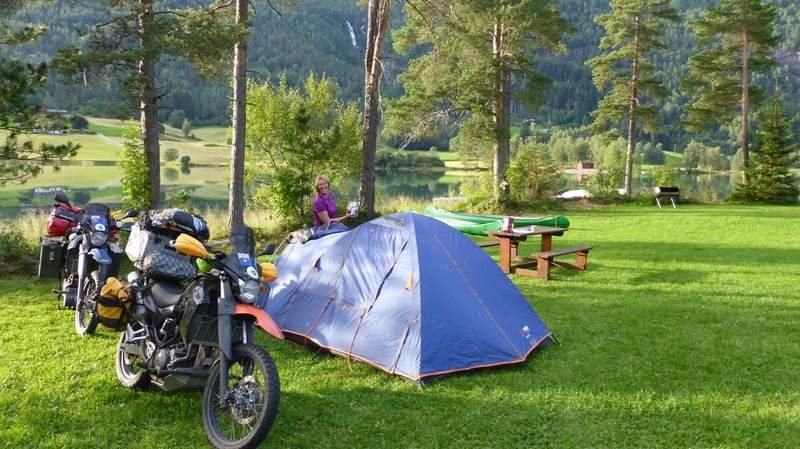 We found a campground just south of Levanger, and put the tent up again. 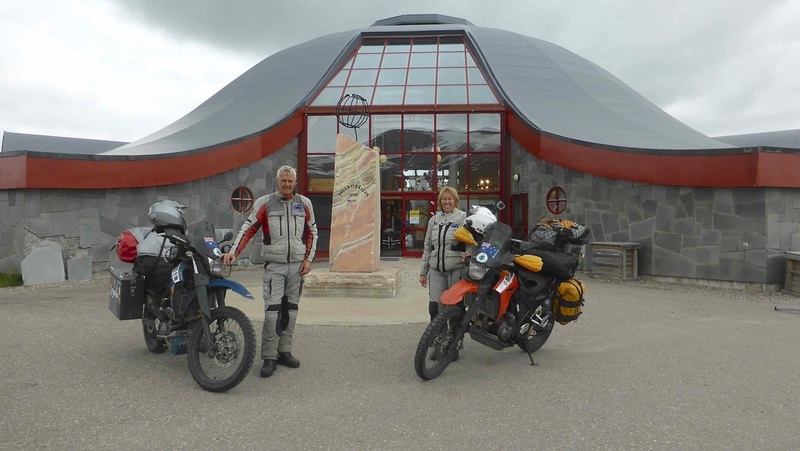 Bryn and Alex, a couple of guys from Wales were camped there on their way up to the Arctic Circle on enduro bikes, so we swapped notes on the roads with them. 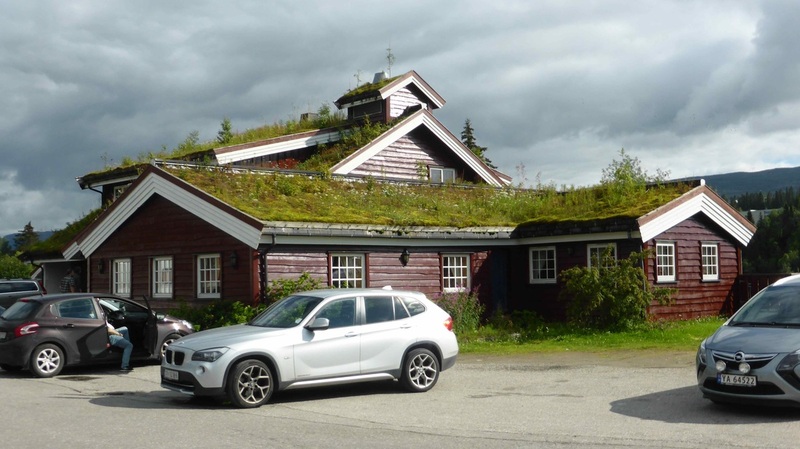 Lots of houses up here use grass on the roof for insulation, this one needs mowing! Packing up the tent today was easy, there was no dew at all, much better when it is dry. Next stop was Hell, a town just south of where we were. We needed fuel, so filled up at the Shell from Hell. It was much warmer this morning, quite pleasant riding down through Trondheim, except in the tunnels, (one of them 5.7 kms long, under the sea between two islands), it's always cold in the middle of them. From there we wound our way over bridges to more islands, and found a campground on the tip of an island at the end of a road. 190 Krone for a tent site, or 300 Krone for a cabin with a heater, fridge, power, microwave, toaster, beds, etc, a no brainer, especially as the weather looked like turning nasty again. 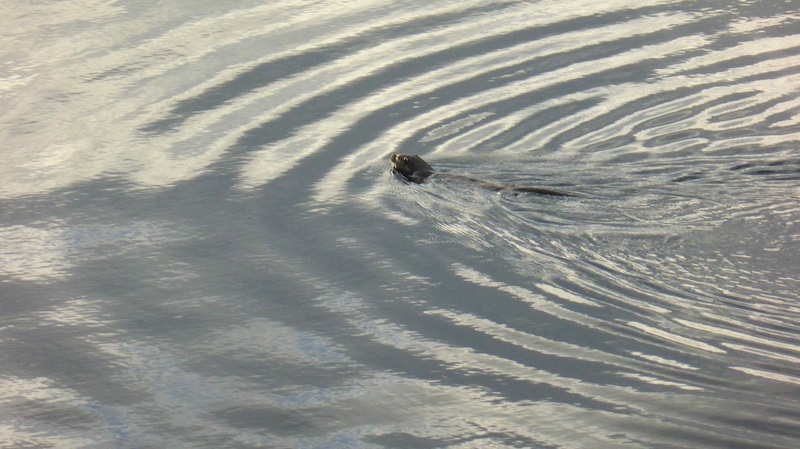 We went for a walk after dinner, and watched an otter feeding in the water just off the headland. 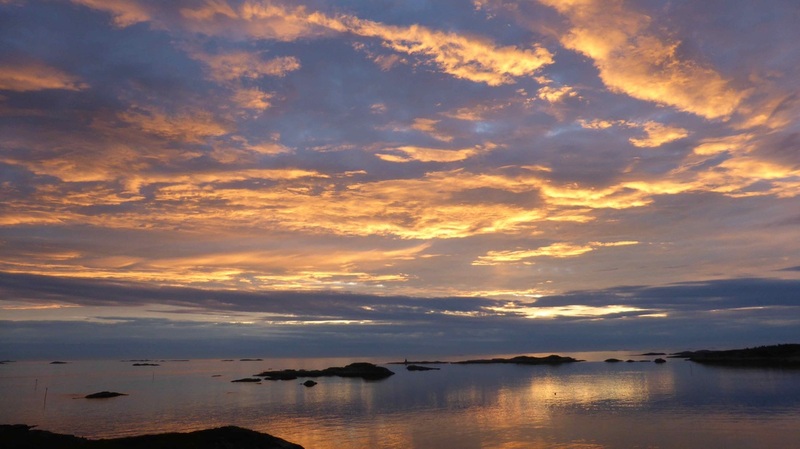 Lyn took some more sunset photo's, at 9.50 pm! Woke up this morning to blue sky peering through the clouds, packed up, and headed over the Atlantic Way, a 13 km series of bridges out over the sea between some of the many islands, with one bridge high enough to let fairly big ships pass underneath, quite an impressive sight. 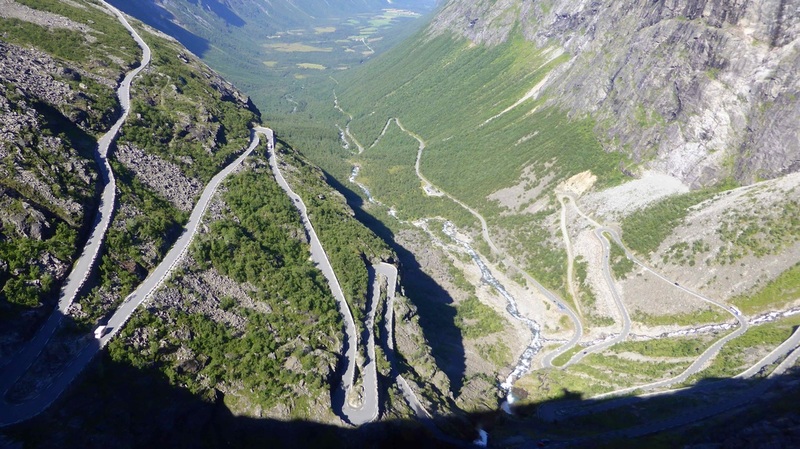 Next stop was the Trollstigen Pass, absolutely awesome, especially as the weather had now cleared, and we had views up and down the valley. It is as good as any of the passes in northern Italy. 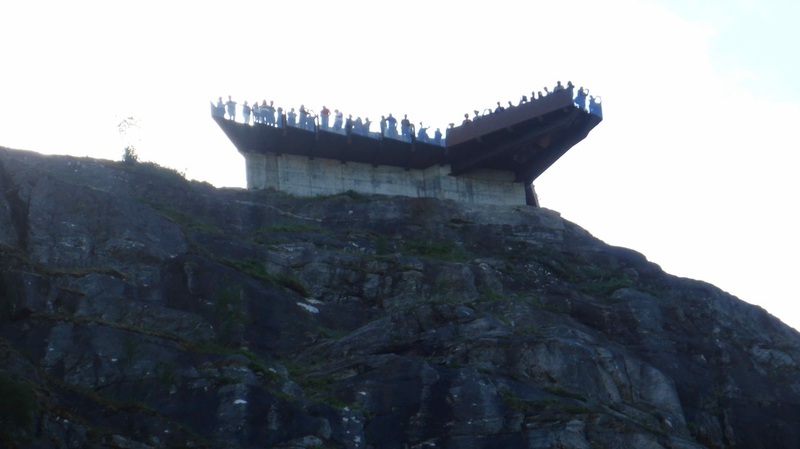 At the top is a walkway, with a viewing platform out over the edge, and a waterfall right next to it, it really has everything! 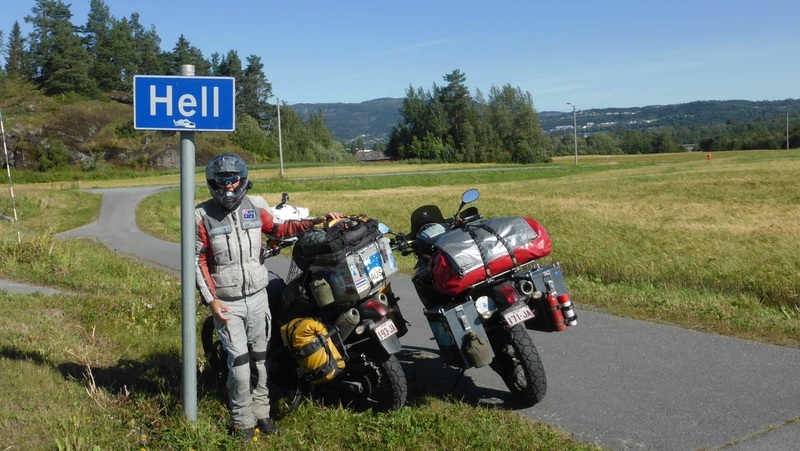 If you come to Norway, you really must ride this road. 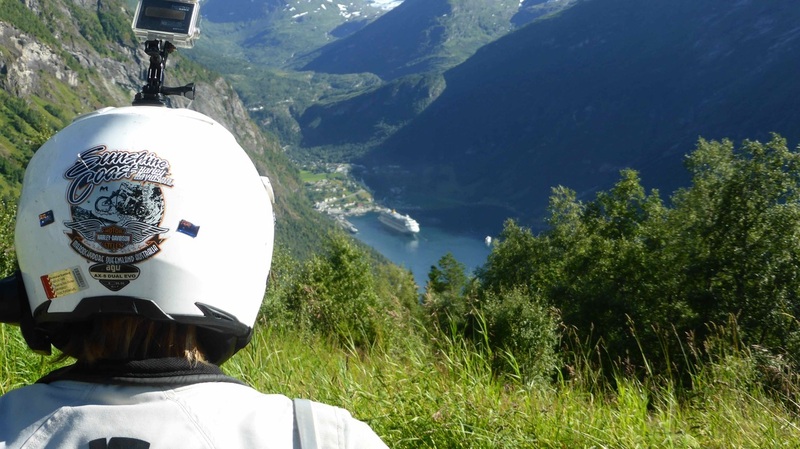 Another ferry trip, then down to Geiranger, more fabulous riding. While we were stopped in a parking area next to the fiord, a pod of small dolphins went past, close to the bank where we were standing. Norway really was turning it on for us! In one of the fiords, a large cruise liner was anchored, ferrying passengers ashore in the lifeboats. 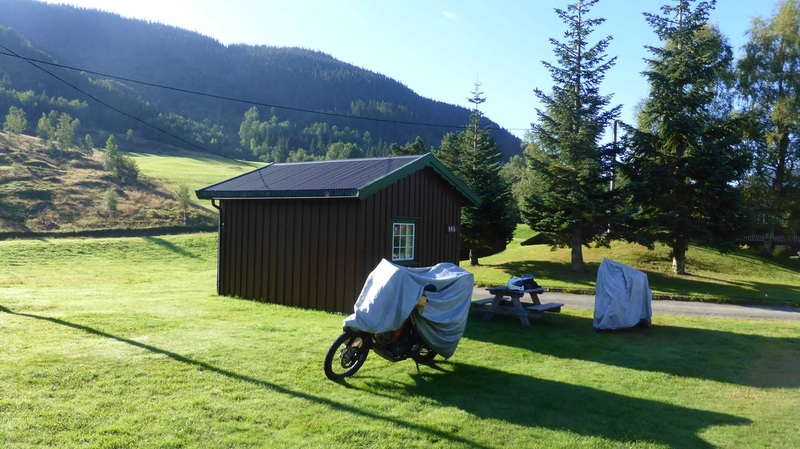 Continuing south, we found a campsite just before Stryn, so settled there for the night after a terrific day on the road, with a bit of everything, including more tunnels, they are everywhere here. Lyn looking at a cruise ship at the end of a fiord, scenery here is unreal! More blue sky this morning, we have been really lucky with the weather. We continued on south past Forde, through another hundred tunnels, and past more waterfalls than I could count, and down to Bergen, a major city in this part of the country. 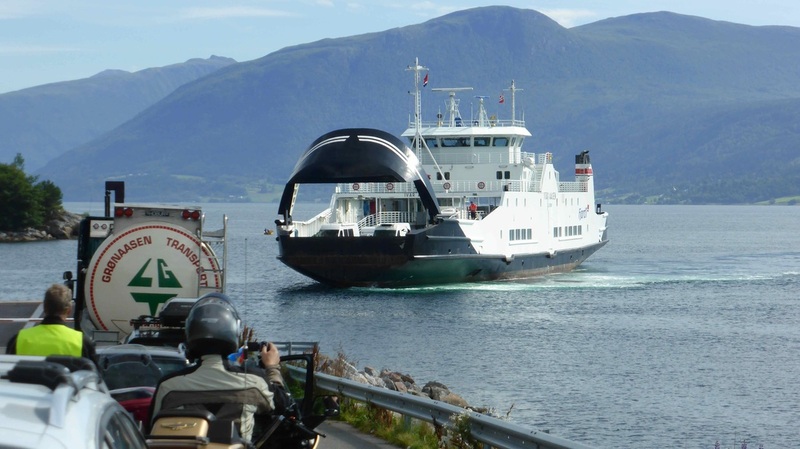 There was another ferry ride across a fiord, cost around 60 Krone per bike, about five dollars Australian. We were avoiding cities, so found a campground on the edge of a lake to the east of Bergen, not the best, but it served its purpose. Tried to get away early (for us), left around 9.30, but with only 1 cup of tea, and no breakfast. Feeling hungry, we stopped at a supermarket to get some supplies, and met some guys delivering ice creams to the shops. Good guys, and very interested in our trip. 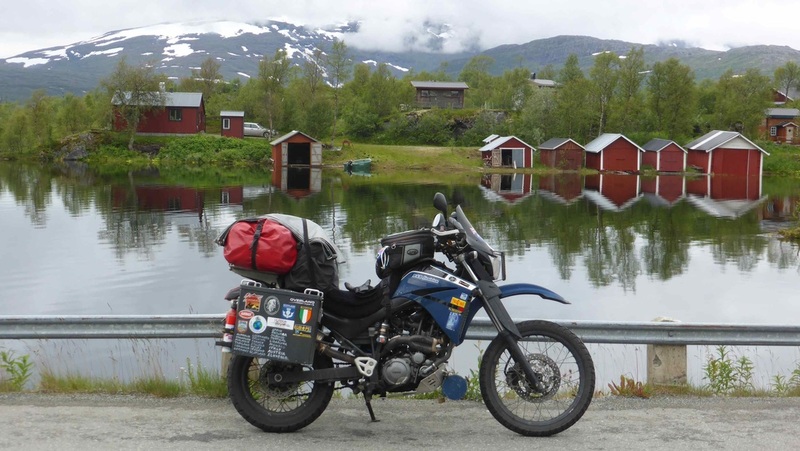 After talking to them for while, and being given some ice creams (breakfast)!, we continued south past Odda, along more stunning roads next to fiords, over mountain passes with lots of hairpins, with patches of snow dotting the road side and mountain tops. And tunnels, did I mention that this country is full of tunnels? We must have ridden through another zillion tunnels today, some so long you wonder if the weather will change before you get out the end. One tunnel had a roundabout in it, lit up with blue lights, very impressive. We went back and rode around it again it looked so good, (not really, we were so gobsmacked with the roundabout we took the wrong exit)! Not long after that, there was another one. Although there was lots of snow around, it was not that cold riding, except in the tunnels, bloody freezing in them. 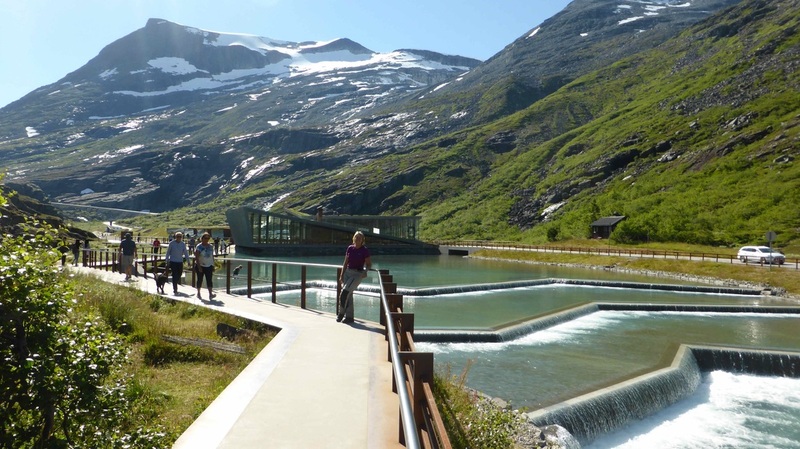 Over the past few days, we have seen some crazy people swimming in the fiords, the water temperature must be all of 12 degrees! The sun might be shinning, but that doesn't mean the water is warm....... Going over one pass, their was a waterfall right next to the road, so we got wet riding through the spray. The road follows a stream along up a hill, and the water pouring down over the rocks right next to the road makes an awesome sight. More blue skies when we woke up, so we got away still heading south. It was really cold riding, especially in the shade of the mountains. We hit the coast at Grimstad, after riding a lot of narrow back roads, and found a place to cook lunch overlooking a beach where some kids were being towed on a tyre behind a speedboat. Up the coast from there to find a Maccas for wi-fi, we needed a place to stay near Sandefjord, where we were catching the ferry over to Sweden from tomorrow. The hotels were all too expensive, and we struggle getting packed up in the mornings when we camp. We needed to be at the ferry by 9.30, and found a B&B near the terminal for our last night in this fantastic country.